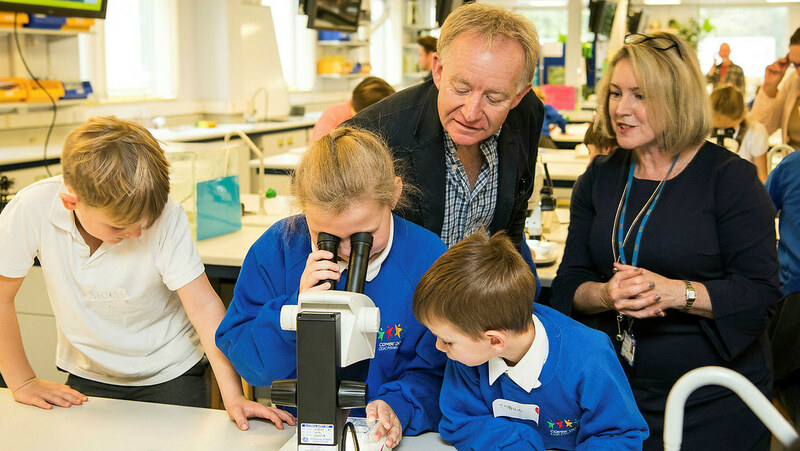 More than 60 local children came to the Milner Centre for Evolution at the University of Bath to meet creepy crawlies and learn how to use a microscope. The Year 3 pupils (aged 7-8), from Combe Down Primary in Bath, were able to touch and handle creatures including turquoise caterpillars, giant African land snails, giant millipedes and stick insects to learn about how legs and wings evolved and how each creature has adapted to its environment. They also used microscopes to study fruit flies, bee wings and locust eggs and learned about the benefits of camouflage. The children got the chance to meet scientists from the Milner Centre for Evolution, with the afternoon ending with a book reading by Dr Tiffany Taylor of her story “Little Changes” about fictitious creatures called rinkidinks that evolve into two very different-looking groups. Director of the Milner Centre for Evolution, Professor Laurence Hurst, said: “Whilst evolution has been part of the primary school curriculum since 2014, many primary school teachers find it a tricky subject to teach as many do not have a science background. “At the Milner Centre for Evolution, we research into the best ways to teach evolution, and how to overcome any obstacles to successful teaching at all levels. We work with schools in supporting them in teaching children the concepts of evolution and how it relates to the world around them. “Our scientists already visit schools to talk about their work, do demonstrations at public events and we have a number of teaching resources to help teachers at all key stages. Mr Andrew Roy, Year 3 teacher at Combe Down Primary School, said: “It’s been really fantastic to have such a huge range of hands-on activities for the children. The day coincided with a ceremony to celebrate the “topping out” of the new Milner Centre for Evolution building, marking the mid-point of the project that is due to open its doors at the end of May 2018. The ceremony was attended by the Vice-Chancellor and President of the University, Professor Dame Glynis Breakwell, as well as Bath’s Deputy Mayor and architects for the project. A commemorative plaque was unveiled by Dr Jonathan Milner, the Bath alumnus and long term educational philanthropist after whom the Centre is named. Dr Milner said: "The process of evolution is fundamental to life. Understanding it better will unlock massive social and economic benefits. The researchers at the Milner Centre are not only advancing fundamental research, but really enthusing the next generation through their passion and expertise." "I am thrilled to see the progress on the new building since the first turf was cut in January and I really look forward to seeing the finished building in spring next year."